As a novice to digital signal processing I have a scenario that probably seems trivial but I dont know the answer to. 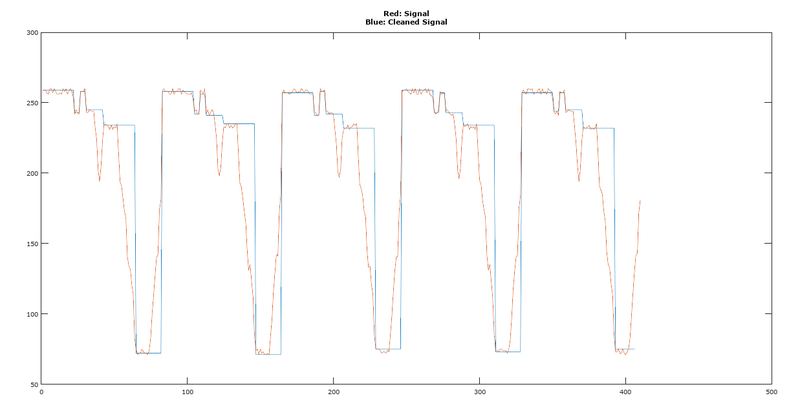 I want to detect when a signal changes but ignore noise. In the above signal there is a constant 255 value then it changes to a constant 130 value (with some noise in between). Is there a signal processing technique that can detect this, ie, it ignores noise and just detects the constant signal? Note the noise can persist for a while but we will always eventually get back to some constant signal value. Context: I am learning computer vision as a hobby. 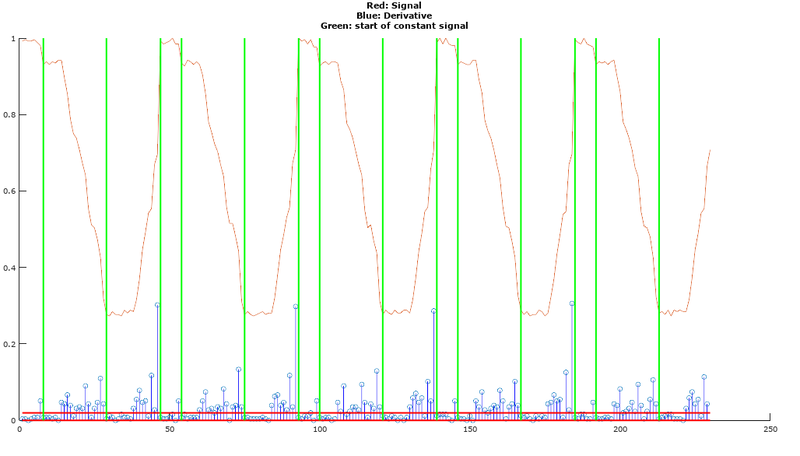 My example signal represents grayscale intensity values (0-255). I want to detect the mode change, ie, detect when the most common value being seen changes whilst ignoring noise. I am aware of image gradients and gradient magnitudes identify areas of rapid signal change. However my signals wont always have a rapid change, they will always however have constant signal values between the change/noise. But this noise could be short or very long. Also the difference between the constant values could be very small or very larges. So it could go from constant value 255->240 or 255->0. As @AlexR mentioned, the digital 1st order derivative is the most straight forward and probably the most trivial solution to the problem, depending on what your signal looks like and the rate of changes involved between samples. The derivative can then be processed in a sliding window to find where it transitions and where it settles (derivative of constant will be close to zero). With these techniques you can reliably detect constants ONLY if the derivative of the signal is greater than the noise amplitude before the signal settles to its constant value. If the rate of change of the signal is slow (i.e. 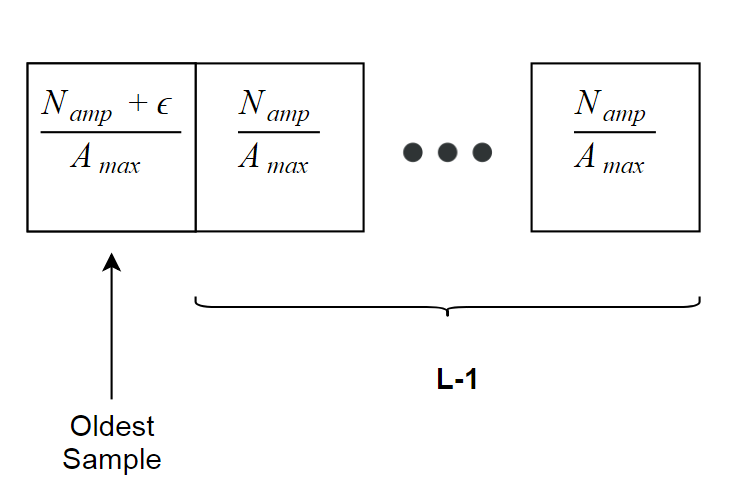 the sample to sample transitions are on the order of magnitude of your noise) then it will be difficult to detect the constant signal from this method. I scale the signals below to be on the same order of magnitude and also take the absolute value of the derivative. should capture some essence of part of this, but doesn't quite capture that ALL samples in this $L-1$ window should be less than or equal to the noise amplitude. This works ok, for example if you say you are only interested in $\epsilon$ greater than 5x your noise amplitude, then you get close, but it misses some transitions. It also seems to behave oddly when the window increases. Another solution that is fairly simple would be to take a digital derivative of your current value, and once that value equals 0 you can compare the signal's current value with the last saved signal value. If it is not the same then you'd save the new signal value and it would trigger what ever behavior you'd want to occur. Small or large jumps can add constrains to the problem, related to total variation. Several other denominations can be searched for, like Piecewise constant Segmentation, Change point detection, etc. The simplest way probably is to look for N consecutive equal values, where you need to choose N according to the nature of the noise. This, however, will results in a delay of N frame. it seems that there is no noise but just the transition between the jump. That is, if noise does exist, there will be fluctuation along all the signal, but the constants ('255' and '130') are quite clean indeed. The transition is due to the fact that, since the ideal sharp jump means infinite spectrum range while practical systems generally have finite frequency respond band, the ideal jump will be smoothed by the system. Then, your problem becomes how to judge the beginning of the jump from the transition. Also, for practical signals, there will be noise indeed. Not the answer you're looking for? Browse other questions tagged computer-vision signal-detection or ask your own question.